"We Buy Fresh and Local, You Eat Well!" 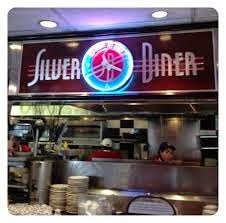 That is the motto of the Silver Diner restaurant. And from what I can tell, they truly live up to that. The first "diner" was credited to a man named Walter Scott in 1872, who started selling lunches out of his horse-drawn wagon. It wasn't until 1939 that we began to see diners as we think of them today...modeled after streamlined train cars or mobile homes with stainless steel or chrome accents and neon signs and art deco decor. The diner was a way to provide fast food while still maintaining a home-cooked-meal atmosphere in a casual friendly environment. There is still a certain nostalgia about them that reminds us of our childhoods or just a simpler time where being kind to your neighbor and going to church on Sunday and having strong family values were still top priorities. The women wore pearls and pretty dresses, the men dressed in nice slacks and knew how to be gentlemen and kids knew how to behave in public and learned respect for adults. Maybe I'm overgeneralizing or dreaming that is was a more perfect time than it was. Or maybe I've watched the movie, Pleasantville too many times. At any rate, the diner still exists, though rare. 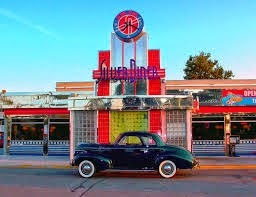 At Silver Diner, one can get a glimpse into that old America. Their food is hearty and fresh. They strive to use local ingredients whenever available and to be environmentally conscious. And they always serve with a smile! When we go there, we like to sit at the bar instead of a booth. Sitting at the bar gives you more of the nostalgic feel of a diner and you get a close-up look at the staff hard at work. Two of our favorite breakfasts to get there are corned beef hash and country fried steak! I'll be the first to admit, corned beef hash looks, smells, and tastes a bit like cat food. But I can't help but love it! Part of the reason I love corned beef hash, is because of a childhood memory. When my dad would take me camping as a child, we almost always had corned beef hash for breakfast cooked over the campfire stove! I usually order mine with eggs-over-easy (one of the few times I don't get scrambled) and it comes with potatoes as well. I'm normally the kind of person who eats one thing at a time on my plate, but this is one exception. I love to mix that runny broken egg yolk with the salty corned beef hash! So delicious and unctuous!! My husband actually turned me on to the country fried steak and eggs. I used to not really be a fan of steak until I learned what good steak tastes like! And how can you go wrong when you batter it, fry it, and top it with sausage pepper gravy!! Man, I love that stuff! I could just drink a glass of pepper gravy! Yes, its that good! And on top of that, you get a warm, flaky, buttermilk biscuit. Put a little pat of butter and a drizzle of honey on there...almost heaven. This diner food makes the perfect hearty breakfast on a snowy day too! And then afterwards, you can go home and take a nap! You're gonna need it!